Analysis of Obama’s climate plan: Carbon dioxide, soot, coal, and Keystone XL. Some of it matters. Some of it looks like résumé padding. 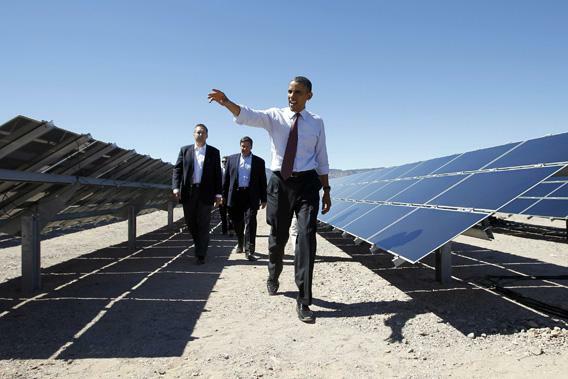 President Obama visits the Copper Mountain Solar Project in Boulder City, Nev. on March 21, 2012. Obama’s recently announced climate action plan puts a lot of emphasis on measures to adapt to climate change. One should be grateful for a president who is willing to stand up and declare—as President Obama did in his speech Tuesday announcing his long-awaited climate action plan—that global warming due to carbon dioxide emissions is a serious problem requiring serious measures, and that “We don’t have time for a meeting of the Flat Earth Society.” After all, as presidents go, we could have done much worse. President Obama is working under serious constraints in the form of a completely uncooperative Congress, and insofar as there is no real substitute for congressional action, there are limits to what he can be expected to do. One can always hope, but anybody hoping for a miracle in the unveiling of Obama’s plan will be severely disappointed. For the most part, the plan follows the recommendations of the President’s Council of Advisors on Science and Technology, which many of us found wanting. Stanford’s Ken Caldeira has described them as a “bunch of small-bore measures” that “fail to articulate a vision in which we transform our energy system into one that doesn’t treat the atmosphere as a waste dump.” I am inclined to agree with this assessment, and I don’t see much in either the president’s speech or the climate action plan to change my mind. Obama’s plan puts a lot of emphasis on measures to adapt to climate change; these are worthwhile and necessary, but they won’t amount to much more than a pinky in the crumbling dike if carbon dioxide continues building up at anything like the rates we are currently seeing. The most important part of the action plan and Obama’s speech deals with measures to reduce carbon dioxide emissions, which the president refers to throughout the plan and speech as “carbon pollution.” This terminology is reasonable, as it is the carbon in fossil fuels which, when combined with oxygen during burning, makes the carbon dioxide, the principal and most enduring cause of global warming. One must not confuse “carbon pollution” in this sense with the emission of particulate soot, known loosely as “black carbon.” Soot is a much shorter-lived and more minor part of the global warming story, which comes up somewhat later in the action plan. Another thing to keep in mind is that, while the president refers to “carbon pollution,” all the tonnages of emissions referred to in the document are tonnages of carbon dioxide, not tonnage of carbon. Carbon dioxide is 27 percent carbon by weight, so one ton of carbon dioxide is equivalent to about one-quarter ton of carbon, which is also roughly the amount of carbon you need to burn in order to produce it. This is just a matter of accounting convention, but one must keep it straight in order to do the arithmetic right. I prefer to do my accounting in terms of tonnage of carbon, and the numbers I refer to are converted accordingly. The usual unit of carbon accounting is billion metric tons of carbon (gigatons carbon, or GtC); 1 metric ton is 1,000 kilograms or about 2,200 pounds, just a bit more than a conventional English (or “short”) ton. U.S. emissions amounted to 1.36 GtC in 2012, representing about 17 percent of the world total, and the contributions of Obama’s decarbonization plan should be measured against these figures. The 2012 U.S. emissions were back down to levels not seen since the 1990s. This welcome decline is in part due to switching between coal and natural gas, but in order to sustain the decline into the future, much more will have to be done (as discussed here and here). Worldwide emissions are what count for the climate, but if the United States is to exert the leadership required to help bring the developing world (notably China and India) on board, it must first get its own house in order. When it comes to carbon pollution, coal is Public Enemy No. 1 by a wide margin. That is because, both in the United States and worldwide, coal represents the biggest, cheapest, and most accessible pool of carbon that is threatened to be dumped into the atmosphere. To make matters worse, coal is a very inefficient fuel, and as usually burned produces more carbon per unit of useful energy than any other fossil fuel. Obama’s commitment to extend EPA carbon pollution regulation from new to existing power plants is perhaps the most important part of the climate action plan. Even if such regulations take years to put into place, as they probably will, the mere fact that such regulations are on the way signals to the energy markets that the future may not be business as usual with regard to carbon pollution, and the rule will help direct capital to more carbon-neutral forms of energy. Until the regulations are formulated, however, it will be hard to pin down how many gigatons of carbon they keep out of the atmosphere. The potential leverage is huge, since current U.S. emissions from coal (primarily in power plants) add up to nearly a half-gigaton of carbon per year. However, Obama has failed to fully engage in the war on coal. The biggest shortcoming of the plan is that it doesn’t do anything to address U.S. coal exports, which have grown as domestic demand has dropped. This has helped keep U.S. coal production steady or growing, and it will cancel the benefits of switching fuels in domestic power plants. The atmosphere doesn’t care where the coal is burned so long as it is burned somewhere. I don’t think much of our exported coal is going to rock collectors who are keeping it locked up in cabinets. U.S. coal exports have doubled since 2007, with much of the increase going to Asia. This increase is equivalent to at least 27 million tons of carbon annually, which cancels out one-half of the reduction in U.S. emissions achieved during 2012. It wouldn’t take too much more growth in coal exports to entirely undo the good the president’s plan may achieve. Insofar as the United States holds some of the world’s greatest coal reserves, there is much more that Obama could have done—and still can do—to assure that as much as possible of it is left in the ground. For starters, he could mandate that climate effects be taken into account in evaluating the environmental impact of new coal export terminals. The current permitting process used by the Army Corps of Engineers does not do this, and indeed it is lax in many other regards. Additional measures the president could have taken would be to include climate effects in the permitting process for coal mining on federal lands and impose climate-impact extraction fees on such mining. Canada’s tar sands are Public Enemy No. 2 in the climate fight, if not in terms of current emissions, at least in terms of the size of the extractable carbon pool they represent. In this regard, a welcome surprise is that Obama included a statement concerning the Keystone XL pipeline in his speech, though not in the action plan itself. In the speech, he proclaimed that the pipeline, which taps into the tar sands production, would be approved only if it did not make climate change “significantly” worse. The key here is how that word “significantly” will be interpreted; the original State Department document soft-pedaled the issue and more or less said the tar sands would be burned regardless so there’s no significant climate impact of the pipeline. The EPA begged to differ. I think it is clear that the pipeline will increase the profitability and hence production from the tar sands, otherwise Canada would not be lobbying so aggressively for it. The important thing with regard to Obama’s policy is that he didn’t really need to mention Keystone at all in his speech. A mention of Keystone followed by weaseling out through careful parsing of the meaning of “significant” is not going to get him much street cred with environmentalists, so one can hope that Obama’s remark signals an intention to take the obvious, if incremental, climate impacts of the pipeline seriously. Some of the things mentioned in the action plan are so trivial they look like résumé padding to me. For example, what is the point of touting 100 megawatts of renewable energy incorporated in federal housing projects? If it displaces coal, it amounts to a fairly trivial one-quarter of a million tons of carbon per year. Similarly, the appliance and federal building energy standards save only 48 million tons of carbon per year—not exactly trivial—but the action plan inflates the significance by comparing the cumulative savings out to 2030 to a single year of U.S. energy related emissions. The 13 gigawatts of permitted renewables planned for federal lands and military installations in Obama’s plan yields a similar savings of 33 million tons per year. That’s nothing to sneeze at, but it will take a whole lot of actions of this sort to add up to something significant. Obama’s climate plan did add one set of actions that was not in the President’s Council of Advisors on Science and Technology recommendations. Namely, the plan gives a fair amount of prominence to control of short-lived climate pollutants, which are emissions other than carbon dioxide that cause warming, but which dissipate within a decade or less after emission (in contrast to carbon dioxide, which sticks around for millennia). The main targets for control are methane (the same stuff as natural gas, emitted from agriculture and leakage from gas extraction), HFCs (a refrigerant that is a substitute for freons that doesn’t destroy the ozone), and particulate black carbon. There is a substantial part of the scientific and policy community which has deluded itself into thinking (wishful thinking, I would say) that early action on such substances could make an important contribution to climate protection. The program is heavily backed by the United Nations Environment Program, and is very popular within the State Department, which no doubt sees it as a way for the United States to appear to be doing something about climate without having to touch the third-rail issue of fossil fuels. In reality, the short-lived nature of these pollutants means that there is little to be gained by spending money and political capital controlling them now. Since their climate effects largely dissipate within a decade, we can wait 100 years if we like, do something about them then, and still get nearly the same benefit in terms of reduced warming. The same cannot be said for carbon dioxide, which sticks around essentially forever. Every extra 100 GtC we emit (as carbon dioxide) while wasting time diddling with short lived climate pollution irreversibly ratchets up the world’s temperature by another two-tenths of a degree Celsius. People also get fooled into thinking the contribution of short-lived climate pollution is a big deal by just comparing these substances’ climate impact to the still relatively modest carbon-dioxide effect at present, neglecting the fact that at the rate carbon dioxide emissions are growing, the contribution of short-lived climate pollutants is going to look pretty trivial by the year 2100, even allowing for their growth. It makes sense to begin controlling the short-lived stuff once carbon dioxide emissions are on a track to go to zero, but not before. Those of us in the scientific community who have realized that early abatement of short-lived climate pollution yields little climate protection are fighting an uphill battle against the juggernaut. From the council report and conversations I have had with certain council members, it seems clear to me that the council appreciates the limited role to be played by early abatement of the short-lived emissions, but it appears that the State Department has managed to win a place for its viewpoint in the president’s plan. I will have a lot more to say about the issue of short lived climate pollution in a future Slate article, but that is for another day. So, the decarbonization measures in Obama’s plan are good and constructive steps. They include a number of other sensible ideas beyond what I have already discussed, such as worldwide efforts to eliminate perverse subsidies for fossil fuels, substantial reduction of financing of foreign coal-fired power plants, and measures to increase the use of renewables and to improve energy efficiency. But all these measures still don’t add up to anything like what is really needed, and nobody should succumb to the illusion that they do. The good news, however, is that Obama has brought the dialogue around to the nature of the solutions to the decarbonization problem. The solutions are many and various, mostly boring and prosaic—and not frightening. They are not precisely painless and risk-free, but neither are they the sort of challenges that Americans have shied away from in the past. President Obama has made a start on leading the nation and world down this path. Where he actually leads, and how much following he picks up, will make all the difference.